Big L Lumber has several prebuilt garage packages you can choose from or bring us your design and we will be happy to work you up a price. From single car to three stall, our garage packages include everything you need to construct your new building. And we offer them in your choice of vinyl or rough sawn siding. For a better value, we can pre-build the wall panels for you. It saves time and money on the job and the cost is very reasonable. If you're in need of a Storage Shed, Big L can help! We offer Gambrel, Salt Box and Gable style sheds in several sizes. We offer prebuilt sheds on 8' and 10' wide packages, or you can buy the materials and build it yourself in 8', 10' or 12' width packages. Call us today for current pricing and availability! Is a shed not big enough? Check out our pole barn packages. You can save money and time with pre-built wall panels. 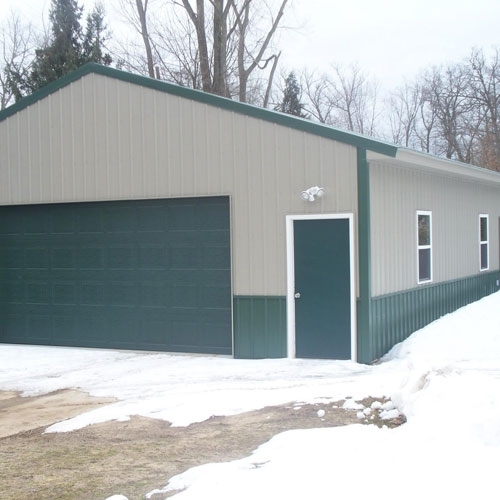 Big L Lumber's own pre-built wall panels can be built for garages and houses, to be delivered to your site in a timely manner, where they can be erected with windows and door openings built to your specifications. Big L carries a stock of Trussway roof trusses. 4/12 pitch 2' overhand 24" on center 59# load. Special orders can be purchased on request.